MPavilion 2014, designed by Sean Godsell Architects, has won the Australian Institute of Architects’ 2015 Victorian Architecture Award in the Small Project Architecture category. The annual awards program, now in its twelfth year, celebrates design excellence and aims to elevate public awareness of the importance of design. 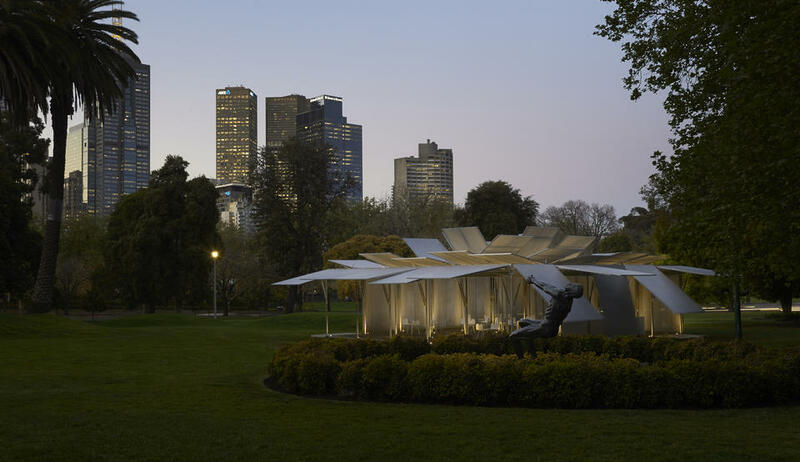 Sean’s MPavilion was shortlisted in the AIA awards’ Melbourne Prize, and we’re equally as thrilled that it is also shortlisted for a 2015 World Architecture News (WAN) Award in the new Temporary Spaces category. A thought-leadership initiative, the MPavilion project is a risk-taking, experimental and innovation commission designed to prompt participation and welcome the broader community into a conversation about design. Taking a global perspective, it looks at best practices within the industry. Each year, an architect is commissioned by the Naomi Milgrom Foundation based on the strength of their international profile as well as their ability to encourage design debate, and make a meaningful contribution to Australian creative industries. Award-winning Australian architect Sean Godsell was chosen as the architect for the inaugural MPavilion in 2014—designing a form inspired by iconic outback sheds and verandas. For this year’s commission, to be unveiled in October, British architect Amanda Levete of AL_A has designed a forest-like pavilion using the latest technology in nautical engineering. Winners of the 2015 Victorian Architecture Awards were announced at the annual Awards Presentation Dinner on Friday 26 June. The awards program celebrates public and peer recognition of the innovative work of Victorian architectural projects, and we’re thrilled to be honoured among the many outstanding entrants. Click here to see the full list of winning projects. Congratulations to all involved!